As a preposition, much like until, till means ‘up to the time of’ or, when used with a negative phrase, ‘before.’ As a conjunction, again, like until, till means ‘up to the time that.’ As a verb, till is used in agriculture and it means ‘to work the soil’ in order to grow crops. Unrelatedly, and now mostly used in the UK, a till is a box or a drawer used in shops or banks where money is kept. Till was also a word used for a drawer in a piece of furniture to keep valuables in, but this meaning is now archaic. We will keep trying till the bitter end. Alison won't get here till tomorrow. Farewell till we meet again. The farmer tilled the ground. The shopkeeper took the customer's money and put it in the till. The desk contained a till for valuables. In geology, a till is a glacial drift consisting of an unassorted mixture of clay, sand, gravel, and boulders. 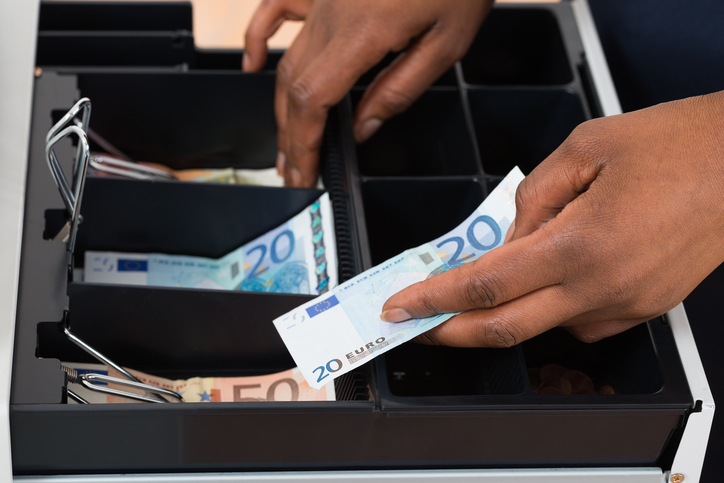 The box or drawer that money is put into in a shop or other business is now normally part of a cash register. In the UK, usually people call the whole cash register the till. Till, as a preposition or conjunction, dates back to before the year 900. The Old English (Northumbrian) and Middle English til originally meant ‘to,’ though it soon came to be used interchangeably with until. It is not, as many falsely assume, a shortened form of until (so never write it with an apostrophe or one ‘l’). It came into English from the Old Norse til (to or until), and can be traced back to the Proto-Germanic tilan. It is related to the Danish til, the Old Frisian til (to or until), the Gothic tils (convenient) and the German Ziel (limit, end or goal). Til(l) is a common preposition meaning ‘to’ in many Scandinavian languages, and some linguists think it originated in the accusative form of a noun, now lost except for the Icelandic tili, meaning ‘scope,’ used in nouns expressing purpose, aim or direction, like aldrtili (death, literally ‘end of life’). It is also related to the English verb till. The verb, meaning ‘to cultivate land,’ dates back to before the year 900. The Old English verb tilian (tilen in Middle English) originally meant ‘to cultivate, tend, work at or get by labor,’ as well as ‘to aspire to, aim at or strive after,’ and is related to the noun till (now lost), which meant ‘fixed goal or point’ and the adjective til (good, useful or suitable), which can both be traced back to the same source as till, the preposition. It is related to the Old Frisian tilia (to get or cultivate), the Old Saxon tilian (to obtain), the Middle Dutch and Dutch telen (to breed, raise, cultivate or cause), the Old High German zilon (to strive) and the German zielen (to aim or strive). By the early 13th century, the sense had narrowed to ‘to cultivate land,’ and by the late 14th century, it had settled on ‘to plow.’ The noun till, meaning ‘cash drawer or box,’ dates back to the mid-15th century. It is unrelated to the other forms of till, and came into English from the Anglo-French tylle (compartment) and the Old French tille (compartment or shelter on a ship). Most linguists think it can be traced back to the Old Norse þilja (plank or floorboard), from the Proto-Germanic theljon. Others, though, believe it came from the Middle English verb tillen (to draw) and the Old English -tyllan, which would mean it is related to the English verb toll (as in bells).